Johannesburg is a city I have lived in on and off for 20 years before recently moving to Paris to start a fair focused on new mobility. During this time mobility patterns have not changed much only the demographic of car ownership. The new black middle and professional class have taken to car ownership as a means of status and mobility. The two new editions to the City’s mobility have been the Gautrain aimed at cars owners and the Bus Rapid Transport aimed at those who don’t own cars. Johannesburg’s has the best traffic flow I have experienced in a major African city and for that matter in any major developing city. Maputo in 20 years has changed to complete gridlock thanks to a growing economy, tiny colonial infrastructure and cheap second hand cars from Japan. Lagos traffic is unimaginably bad – I achieved 3 meetings in one day and spent 5 hours in the back of a car bumping along at pace slower than a walk. A recent trip to Jakarta took 2.5 hours for the 15kms from the airport to the hotel and like many of you I have horror stories of Delhi traffic too. So Johannesburg is blessed with an impressive road infrastructure that despite many emerging potholes is still in good working order. There is high car ownership amongst those that have a job earning anything up from $1000/month and South Africans across race and class are generally a car loving nation. What has slowed car ownership is a slowing economy and a radically devaluing currency that has pushed car prices up. The Johannesburg International Motor Show, one of the oldest in the world has been indefinitely postponed – an indication of the pressure felt by the motor industry. In these tough economic times, growth has been limited to hubs like Sandton and this is were the business community are experiencing heavy congestion. I have had numerous discussions with big corporates in Sandton who eager to assist their staff with a more efficient commute but in a country where government and business are usually at the opposite ends of an argument, they have been unable to harness their resources and find a workable solution with the city. It was against this backdrop that I returned to my home city to deliver an address on what I think the future of Urban Mobility will be, having spent a year speaking to sponsors, potential exhibitors and city transport managers. The trend I am seeing in Europe is massive growth in multi-modal solutions dominated by electric bikes, a huge uptake in on-demand and sharing solutions led by Uber and companies like Zip on sharing front. I now expect there to be unstoppable growth of electric vehicles thanks largely to VW’s Dieselgate and the promise of driverless cars becoming a reality in certain situations within 5 years. Another new development is that City Transport Managers are actively working with private companies to reduce car ownership. At present Uber is the only mobility company that I know of that his made any traction in Johannesburg. It is used by out of town businessmen who fly in for meetings and locals when they go out to dinner or parties to avoid drinking and driving. To my knowledge it is yet to have an impact on car ownership as it has in Paris. The mobilty research company 6t claims every Uber vehicle in the city, reduces car ownership by 4 cars – something the city wants despite the difficult politics of supporting Uber. In my opinion, Johannesburg sits with two major Urban Mobility challenges facing the two extremes of the workforce. The first is how to get the Sandton based work force in and out of this business district each day. The productivity lost by having CEO’s of multinationals, bankers, lawyers, accountants etc sitting in gridlock for over an hour a day is massive. The second challenge is how to move low paid workers and poor job seekers in and out of the city that reduces the cost and time of their commute. I believe that the Ecomobilty Festival needed a specific frame and objective as opposed to trying to cover all the possible ways of new mobility. The idea of a festival to let urbanites experience new ways of commuting is exactly what the city needed as there is an audience looking for solutions and as research has shown when people experience new mobility solutions by test riding an e-bike they are far more likely to change behavior than when they only read about it. 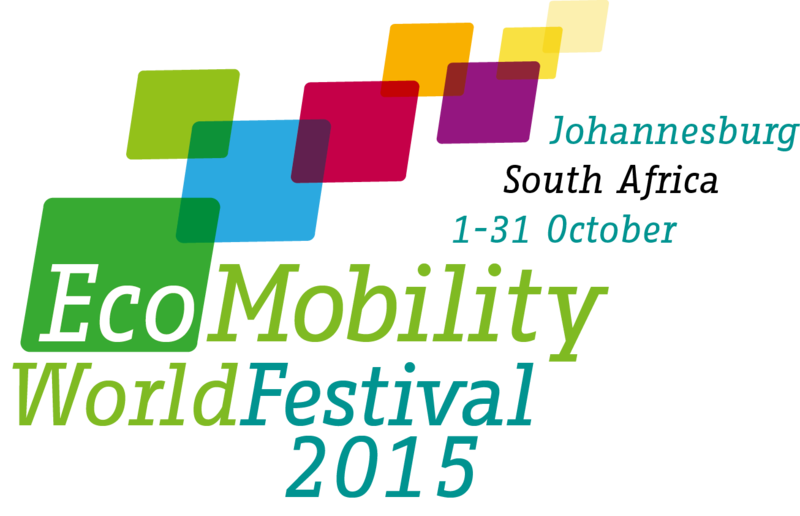 It was a bold decision to place the festival in Sandton but the Sandton Gautrain Station presented a great opportunity to show how new mobility solutions work for “the last mile”. The road closure got the press and public talking which achieved the first Key objective of the Festival. The second was to get commuters to experience new mobility and this is where I think the Festival failed. When motorists had some of their roads closed and were not given alternative mobility options it created a negative impression of The Festival as they felt that they were net losers from the initiative. I walked around the exhibition on the opening Thursday for an hour from 5pm and was the only visitor among the confusing mobility devices on show that included a Kayak. The substantial tender was awarded to company that had no mobility or event experience and it showed. A temporary e-bike share system that integrates with the Gautrain card for security would have given Sandton drivers an experience of new mobility. In the weekend that I was there I only saw pedestrians taking advantage of the closed roads and the odd cyclist. I have no doubt that e-bikes and bike lanes provide the solution for Sandton traffic. Most workers have basement parking with power and the distances and hills provide a challenge for conventional cycling. Regarding the second challenge of how to move low-income workers cost and time effectively solutions now exist that are not about expensive infrastructure. There is a very effective privately owned public transport system in South Africa running 10 seat mini busses throughout the country and city. It is a system that has grown organically and moves more people than any other form of public transport in South Africa. It is a problematic service as it is often dangerous and commuters can have a long wait for the taxi as there is no accurate time timetable of when and where they move. Having attended the Cities on the Move Conference at Google Campus in London last week, I was amazed to see city transport managers from London and San Francisco are working with private companies to provide effective mobility. Instead of looking for cost intensive infrastructure solutions they are looking at ways of getting mobility to mesh on open platforms. The mini-bus taxi industry could be made safer, cheaper, faster with the use of a simple app. Bridj is a US based “pop-up mass transit system”. The app adapts in real time to where you live and work. You tell the app where u want to go and it tells u to walk to a point within a 5 minute walk, were a bus picks you and other commuters up and the algorithm tells the driver where to drop you all off within a 5 minute walk of your destination. There is not waiting, busses run at full capacity thereby reducing costs and the users have the power to rate the service and the driver. It would solve a host of the poor’s commuting challenges. Smart phone costs and bandwidth keep coming down while the costs of building infrastructure keep going up. My concern is the City of Johannesburg were unable to use Ecomobility as a platform for business, innovators and government to work together. Instead it once again became a debate of government verse business.